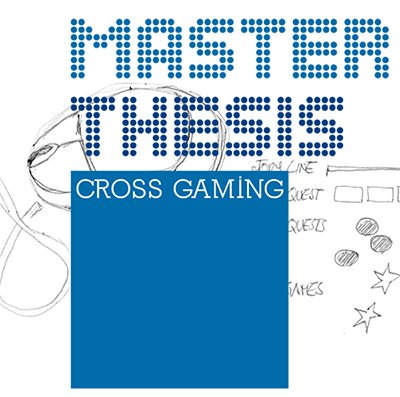 Masterthesis | "Cross Gaming", 2011 | U.A.S. Joanneum, Media and Interaction Design. Cross Gaming stands for absolute immersion into the game. It is the response to the gamers wishes. It is future gaming. Cross gaming means platform-overreaching gameplay, where a game is not limited to a specific gaming console or taget group. Cross Gaming tells a story from an epic universe on multiple gaming devices at once and enables interactions never seen before in the world of multi-player gaming. It connects players from oll platforms to experience the same game together. The concept provides a solution to the question of how to keep a game challenging for all the different types of players (from noob to core). It connects them into one gaming universe and provides game experience for all major genres (RPG, strategy, shooter, etc.). These might range from family entertaining mini-games to time extensive quests – with great replayability where the gamer gets rewarded for in-game progress with additional content and achievements. The user’s “digital me” is the gamer’s representative within the game and in the social online base. Additionally, Cross Gaming is a form of social entertainment, where the best services and features of various existing platforms are merged into one ultimate gaming network. Cross Gaming is a concept that emphasises on the cooperation of many gamers in beating the game. Cross Gaming: It’s not a game concept, but a gaming concept.